How do I set up a deposit so that it is available in SWRemote to apply to an invoice? 1. Create a job in SuccessWare21 and assign it to a tech. 2. Sign in to SWRemote as the tech that you assigned the job to. 3. Dispatch and Onsite yourself. 5. Continue through to the Work Authorization screen and in the Payment Amount field on the Payment Type screen, fill in the amount you would like to take as the deposit. 6. Continue on to the Payment screen. 7. In the Payment Amount field, verify that the amount listed is the amount you want to take as the deposit. 8. Complete the job on the device. 9. Have the Technician call the Office and alert them that they need their last job set up as a Deposit. 10. In SuccessWare21, Add a call, and keep the existing assignments from that first call. 11. Click on the job that was just completed and hit the F10 button to pull up the invoice. 12. Save the invoice by clicking the Save button. 13. Click the Apply Payments button to post the invoice. 14. Make note of amount and type, and clear out payment and tap OK.
15. Click the F4 button to bring up the Billing Account History. 17. Select the option for Customer Deposit. 18. Fill in the amount that the customer paid as the deposit in the Amount box, and the Payment Method, from earlier. 20. 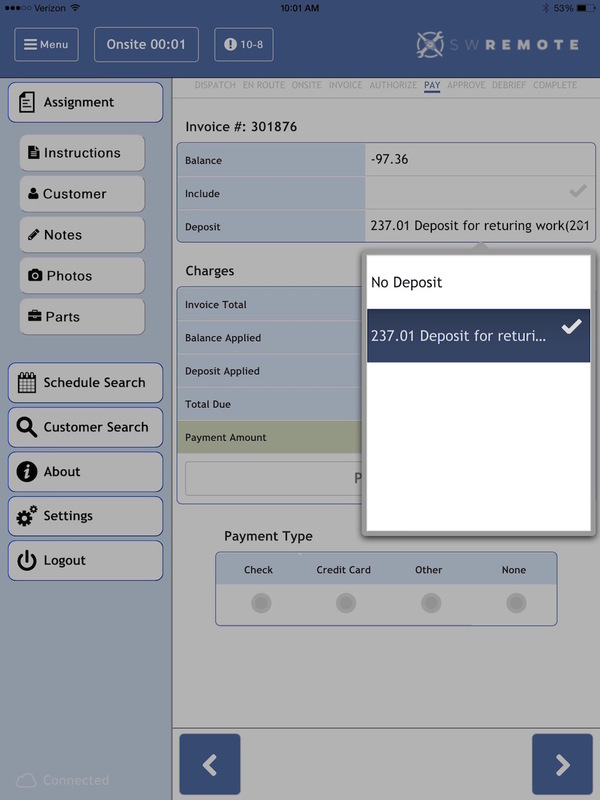 On the next assignment for that customer, The Tech will be able to select the deposit from the dropdown box and apply that as a payment towards the invoice within SWRemote. 21. Make a Note for the Technician in the Job Notes, so that they know they will need to Press the "Deposits" dropdown on the payment screen, to apply that. 22. To use a deposit that has been attached to a billing account in SuccessWare21, simply click the dropdown box labeled Deposit on the Payment screen (shown below)and select the deposit you wish to apply to the open invoice. If there is nothing available, it means there are no deposits available on the account. If you have any additional questions, you may reference our online help documents at www.help.swremote.com, call our support team at 1-800-566-6940 or email a support ticket to our support team at [email protected].